Decentralised championships have their cost-efficient justification, but what if you want to see the other domino players live? In 2002 Rüdiger Neukamm created an incentive for real competition encounters by donating a trophy. If there is a Mother Theresa rule, Mary Theresa must not miss out, he thought to himself, and so the name of the tournament was born. 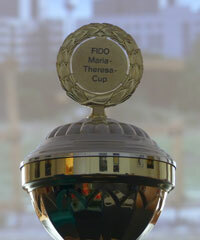 The first tournament was consequently held at his premises, and since then domino players have met once a year to select a new winner of this challenge cup. Dissatisfied with the hard to understand FLADUB formula, which calculates the winner, Björn Wolst from Bremen donated another trophy for the player who simply scores the highest score in the tournament. Since 2015, this second trophy has also been awarded annually.